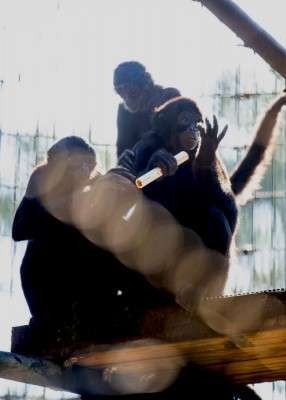 Monkey Jungle, Miami, Fla. Spider monkey performs tube task. FIU psychologist Eliza L. Nelson has observed several of the lanky-armed monkeys using individual fingers to grab food. Previous work suggested the spider monkey hand operated like a hook. But in Nelson's study the spider monkeys also were able to insert one or two fingers into a tube to grab a serving of peanut butter. It is the first time this type of independent digit control has been reported for this species. The unexpected observation occurred during Nelson's research study evaluating measures of handedness – the tendency to use one hand more naturally than the other – in nonhuman primates. Spider monkeys' hands are not like most other primates – they have four fingers and no thumb – making them an interesting model for studying grasping and motor function. "In this study, we used two popular measures that had never been administered to this type of spider monkey before," Nelson said. "We collected a large number of data points on each measure to allow for analyses. 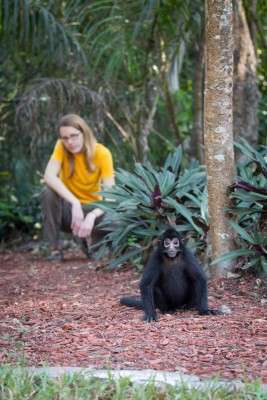 Nelson's team analyzed reach and coordination – both of which are particularly difficult for spider monkeys given their unique hand structure. Comparing results of both tasks is critical for understanding the evolution of hand-use preferences in primates. Monkey jungle, Miami, Fla. Nelson observes a young spider monkey. Contrary to predictions and previous findings, Nelson's research shows multiple measures are needed to fully characterize the concept of handedness – the tendency to use one hand more naturally than the other. Nelson determined a single handedness test cannot effectively predict hand preference in nonhuman primates. The findings were recently published in the journal Animal Cognition. "When we're thinking about measuring handedness in any species, including humans, measures should assess multiple components of hand function," Nelson said. "Handedness is not unique to humans, and this kind of work in cognition helps us understand how the primate brain works and how it has changed over time." Handedness is one example of hemispheric specialization – when a particular function is localized to one side, or hemisphere, of the brain. In the motor system, each hemisphere largely controls the opposite side of the body. It is important to understand patterns of how or why one hemisphere is dominant (lateralization) because a number of human disorders including autism, schizophrenia and developmental coordination disorder are associated with atypical lateralization. "By studying how the hands are used using easily measurable behaviors, we can learn about how the brain is organized and also how it has changed over evolutionary time," Nelson said. "I hope to make an important case for standardizing measures in this field as well as fill a gap in our knowledge of handedness in primates." Nelson is the director of FIU's HANDS Lab focusing on motor skill research in children and nonhuman primates, specifically how the hands are controlled. Her work examines links between motor abilities and cognition including reasoning, communication and language.